In several animals such as deer, sheep, and caribou in which newborns remain dependent on their mothers beyond birth, mothers often segregate themselves and their offspring into habitats that differ from those they use when without offspring (Pack et al. 2018). The motivations underlying such changes can range from predator avoidance to promotion of mother-offspring bonding to avoidance of male harassment. Humpback whales are found in all the world’s oceans, have separate feeding and breeding grounds, and undergo some of the longest migrations of any whale species. It is well established that humpback whale mothers with newborn calves favor shallow waters in their breeding grounds, with recent research by Dr. Alison Craig and colleagues indicating that this appears to be a tactic employed by mothers to avoid energetically costly associations with males (Craig et al. 2014). However, it is not known how this preference varies as a calf ages and grows and whether mothers, who are less likely to ovulate than females without a calf, employ other tactics to avoid males when in deeper waters. Dr. Adam Pack from the University of Hawaii at Hilo has been studying North Pacific humpback whales in the Hawaiian Islands, their major breeding grounds for over 20 years. In the late 1990s, Pack along with Drs. 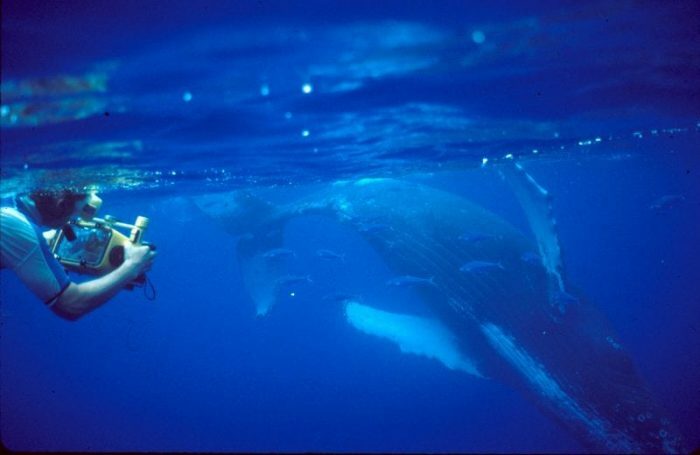 Louis Herman and Scott Spitz developed a new technique called underwater videogrammetry to measure the body sizes of humpback whales at sea while simultaneously recording their behavior and social interactions. Using this method, Pack and colleagues showed that body size confers an advantage to male humpback whales when competing for females (Spitz et al 2002), that larger females produce larger calves and consequently attract greater numbers of males than do smaller females (Pack et al. 2009), that mature females prefer to associate with the largest males (Pack et al. 2012), and that both mature and immature males produce long complex vocalizations called “song” (Herman et al. 2013). Dr. Adam Pack prepares to measure a female humpback whale using videogrammetry in waters off Maui, Hawaii, (c) The Dolphin Institute, NMFS Scientific Permit 1071. 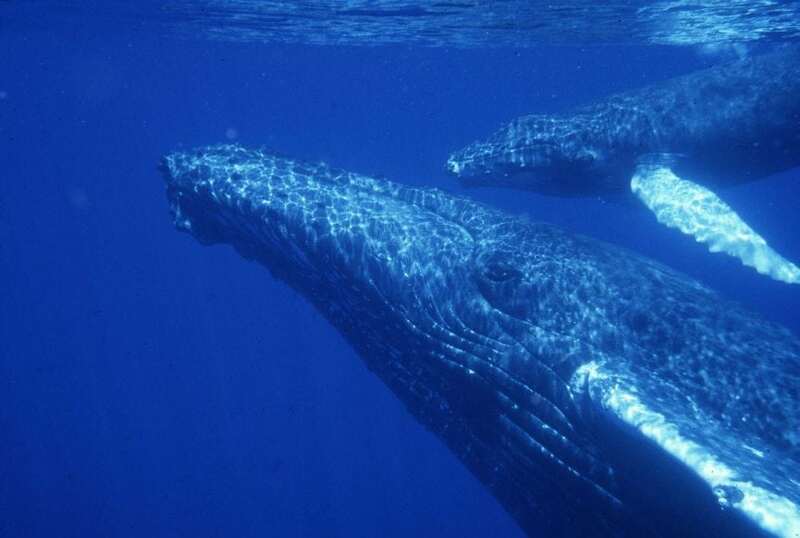 In their latest work, Pack’s team measured the lengths of 96 humpback whale calves in waters off Maui, Hawaii ranging in size from 3.8-7.6 meters (adult humpbacks typically range from 13-15.5 m in length). They found that the depth of water that a mother and her calf occupy is positively related to the size of the calf, so individual females tend to be found in deeper waters as their calves mature. To confirm this, the team also examined the habitat preferences of 72 mother-calf pairs who were resighted over various intervals within a breeding season. They found that the magnitude of water depth change between initial and final sightings of a mother-calf pair increased significantly with their resighting interval. That is, as a calf aged, it tended to be found in deeper waters with its mother. Interestingly, the team also found that when mother-calf pairs were in deeper waters they had a preference for rugged seabed terrain. They suspect that this kind of terrain provides more ‘acoustic camouflage’ from males than does flat terrain in the sense that it tends to be noisier from snapping shrimp. This might help mothers avoid harassment from males seeking mating opportunities by making it less likely that they are overheard communicating with their calves. This final bit is very intriguing as it may indicate a strategy evolved in mothers for mitigating male harassment while preparing (in deeper waters) for emigration back to the feeding grounds. These findings are reported in the journal Animal Behaviour in the article “Habitat preferences by individual humpback whale mothers in the Hawaiian breeding grounds vary with the age and size of their calves” by Adam A. Pack (University of Hawaii at Hilo and The Dolphin Institute), Louis M. Herman (University of Hawaii at Manoa and The Dolphin Institute), Alison S. Craig (Edinburgh Napier University), Scott S. Spitz (The Dolphin Institute), James O. Waterman (Liverpool John Moores University), Elia Y. K. Herman (The Dolphin Institute), Mark H. Deakos (Hawaii Association for Marine Education and Research), Siri Hakala (Pacific Islands Fisheries Science Center, NOAA), and Carley Lowe (University of Hawaii at Hilo). Spitz, S. S., Herman, L. M., Pack, A. A., & Deakos, M. H. (2002). The relation of body size of male humpback whales to their social roles in the Hawaiian winter grounds. Canadian Journal of Zoology, 80, 1938-1947. Previous Post« Previous Voice Pitch Influences Voters, But Do We Pick Better Leaders As A Consequence?